Cruise the seas in style this season and feel like a real tugboat captain with this outstanding quality radio control vessel. Modeled after the real Southampton harbor tugboats, this sea worthy remote control tugboat sports realistic details from hull to main mast. It�s silky smooth operation will immerse you in another world of fun and enjoyment! Advanced features include powerful twin motors, metal propellers, rudder, digital proportional throttle and extended range transmitter for the best cruising experience. Drive forwards, backwards, left, and right with ease. Unique design and 2.4G radio system allow for racing up to 10 tugboats at the same time. Ready to run, fully assembled and includes rechargeable 7.2v battery pack, transmitter and display stand. At nearly 2 feet long and a top speed of 11 knots this tugboat is sure to impress the captain in you. Looking to make this season memorable, order 2 or more legendary tugboats today and multiply the fun. 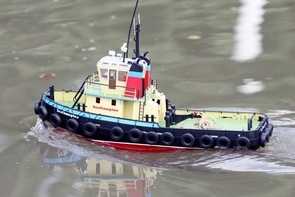 This RC Tugboat has it all including a working crane and a real water shooting cannon!